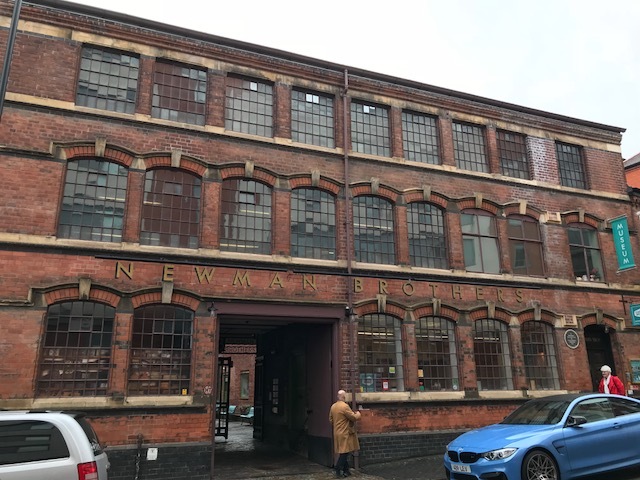 Exterior of the original Newman Brothers factory building on Fleet Street in Birmingham. A selection of handles and decorative features for attaching to coffins. One of many designs ready for stamping onto metal. The handle design used on the coffin of Winston Churchill. Shelves full of products ready for orders. This room was full of workers using the fly presses to stamp and pierce small decorative items. A row of sewing machines where seamstresses sat for 12 hours a day making coffin shrouds.